Until 2005’s Land of the Dead, George A. Romero hadn’t made a zombie film in twenty years. Mind you, this is the filmmaker who originated zombie horror back in 1968 with Night of the Living Dead, mastered its socio-allegorical relevancy in 1978 with Dawn of the Dead, and took a harsh bite out of the government in 1985’s Day of the Dead. His return, ushered by a re-popularization of the sub-genre by Danny Boyle’s 28 Days Later and Zack Snyder’s 2004 remake Dawn of the Dead, came gilded with newfound faith that the auteur behind zombified cinema could reestablish himself as the Master of the Living Dead. Produced by Universal Studios, who also released Snyder’s revision and brought Edgar Wright’s brilliant British comedy Shaun of the Dead to American audiences, Romero’s new film turned out to be the equivalent of James Cameron’s Aliens to that franchise: A bigger, more expensive, more lavish production filled with machine guns and impressive effects and sweeping ideas. Whereas Romero’s previous zombie films contained confining settings (a farmhouse, a mall, an underground bunker), this film too limits space, but on a grander scope: within an entire sectioned-off city. The story begins “some time” after Romero’s previous zombie films, when the apocalypse has long since dominated the planet. Hundreds of survivors pack into a few square city blocks, a spot at the center of Romero’s own Pittsburgh, Pennsylvania, where high-rise buildings look down at the surrounding squalor. Fenced-off or protected by water on all sides, those left endure by carrying on with life. The underprivileged enjoy vices ranging from gambling to prostitution and survive on the street. A fortunate few live in Fiddler’s Green, the upper-class superstructure at the hub of their new civilization, where board meetings are still held and bank vaults still serve their intended purpose. All behave as if society will someday return to normalcy. Intelligent hero Riley (Simon Baker) and his scarred sharpshooter friend Charlie (Robert Joy) know better, seeing the worst of their situation on recon and supply missions completed their city’s leader, Kaufman (Dennis Hopper, in a wonderfully funny and megalomaniacal performance), a corrupt and opportunistic businessman who smokes cigars, drinks champagne, and picks his nose. During their latest excursion for provisions in a nearby town crawling with normally mindless living dead, Riley notices one of them has problem-solving skills. Dubbed Big Daddy, the zombie (played by Eugene Clark) teaches others like him to communicate, to ignore the fireworks Riley’s team shoot into the sky to distract the “stenches,” and to follow his lead. Suddenly, zombies no longer writhe about without purpose; instead, though still lurching with the occasional undead hobble, they move toward a light in the distance, toward Fiddler’s Green. From film to film, Romero’s zombies have progressed, gradually proving there’s more going on in their rotting skulls than a driving hunger to eat human flesh, as first demonstrated in Night of the Living Dead. In Dawn, the undead have a latent memory, an attraction toward the shopping mall where survivors hole-up—as one of them says, “They’re after the place. They don’t know why. They just remember. Remember that they want to be in here.” The mad doctor Logan in Day hypothesized that the undead could be taught manners, and thus civilized; his living example was “Bub,” a zombie that salutes soldiers and would prefer to shoot someone than bite them to death (now that’s civilized). Land of the Dead’s zombies recall how to use tools, understand the concept of weapons (beyond their own teeth), and strike out of vengeance for their kind’s mistreatment. Romero posits an allegory for the current political-economic separation in America’s growing polarity between rising poor and ultra-rich, by placing the upper classes in Fiddler’s Green and the folks working to support them in the slums. With this in mind, zombies become a strangely liberated entity, rising out of their complacency against The Powers That Be to strike them down from their tower. The film might conversely (and ironically) be called Land of the Free, as the undead consciously reclaim their city, while Riley and company escape the confines of the city onto the open road. Amid the social relevancy, of course, are Romero’s long voyages into grotesque gore and the consumption of living tissue. The theatrical exhibition was annoyingly wrought with zombies passing over the frame during particularly nasty scenes, thus the gore was only alluded to. Romero’s low-budget work in the past has been deemed too graphic and released Unrated, which meant showings on fewer screens but artistic integrity. Releasing a comeback film without an MPAA rating in today’s market is commercial suicide, however. And so, taking advantage of the DVD marketing scheme of “Unrated Director’s Cut”, Romero pleased both the studio with an R-rated theatrical exhibition, and himself with an uncensored cut on home video, complete with the conveniently-placed gore-blockers removed. 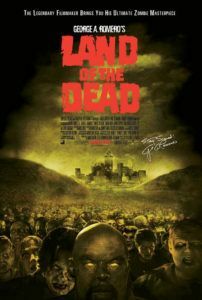 Even in its censored form, Land of the Dead managed to spark some controversy, as Romero’s films have always been the subject of debates and protests and bans. Representatives from the Ukraine, for example, banned the film on these grounds: “The memory of the Holodomor [a famine in the country that killed millions and induced cannibalism in some areas] of 1933 is still fresh in our society. A movie with scenes of people being eaten alive should not be given the go-ahead.” Indeed, Romero’s film contains those horrible scenes of bloody violence we’ve become accustomed to in his work, rendered even more potent by the film’s impressive $15 million budget (the highest of Romero’s films). Returning to form, George A. Romero outclasses modern reinventions by reminding audiences that for things to change, they must stay the same. While running zombies in revisionist takes on his formula have proved commercially successful, from an artistic standpoint (with the exception of Boyle’s film) they’re largely empty. 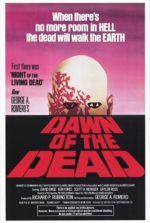 Nothing quite punctuates social commentary or suggests psychological and social zombism than the deliberate and lurching crawl of the living dead. Following Land of the Dead’s minor-but-profitable box office achievements, Romero released the underrated Diary of the Dead, and today is at work on yet another entry into his zombie universe, this one set on an island. He continues to operate gloriously according to nearly forty years worth of his established cinematic rules for his brand of horror, certifying why his archetypes can be copied but never matched.